يقع في تاون سنتر, Discovery Holiday Parks – Byron Bay إنه المكان الأنسب لاكتشاف خليج بريون و ما يحيطها. يحظى هذا الفندق ذو 3.5 نجمات بمكان ممتاز يسمح بالوصول إلى المعالم السياحية الأكبر في المدينة، فهو يبعد مسافة 2 km عن صخب المدينة. بالنسبة لمن يريد الخروج، هذه بعض المعالم السياحية المتوفرة للزوار ريلاكس هيفن, كيدز كلوب, Hammer and Hand Byron Bay Jewellery and Metal Collective. إن الخدمات الممتازة وحسن الضيافة العالي في Discovery Holiday Parks – Byron Bay تجعل إقامتك تجربة لا تنسى. يقدم هذا الفندق العديد من الخدمات الكفيلة بإرضاء أكثر الضيوف تطلباً. تنعكس أجواء Discovery Holiday Parks – Byron Bay في غرف الضيوف.تلفزيون بشاشة مسطحة, اتصال لاسلكي بالإنترنت, اتصال لاسلكي بشبكة الإنترنت (مجاني), غرف لغير المدخنين, مكيف هواء هي بعض الميزات الموجود في العديد من الغرف. يمكنك الاستمتاع بالأجواء المريحة التي تقدمها حمام سباحة خارجي, ملعب تنس, حديقة طوال النهار. 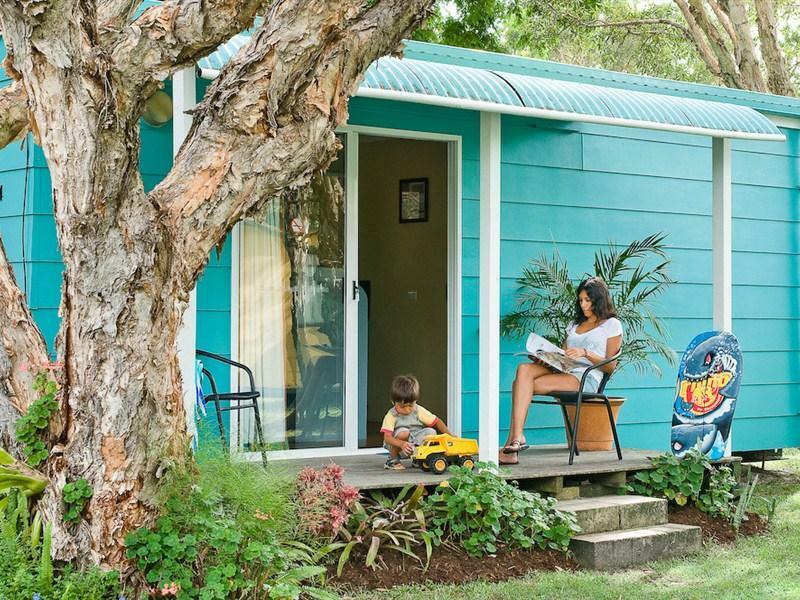 إن Discovery Holiday Parks – Byron Bay هو خيار ذكي بالنسبة للمسافرين إلى خليج بريون، بما يوفره من إقامة هادئة ومرحة. Amenities were great. Waterpark, pool & jumping pillow were a hit with the kids. 5 minutes drive to town. Only downside was we found a smelly, mouldy microwave meal with maggots & weevils in our rooms microwave. Booked in at the last minute so was only able to get the Glamour Safari Tent. Much more than I would normally spend but absolutely worth every penny. Beautifully presented and super comfortable while still feeling like camping. Eating in is the big bonus, with great kitchenette and bbq on the deck. The extra money spent on the Safari Tent was saved by cooking in, with style! The cabin was generally clean, however at $140 a night there were a few problems such as a shower head that if you tried to adjust it it fell on your head. The lounge area was stained. The main bedroom was fine but the bedroom with bunk beds smelt strongly of urine which if we didn't keep the door closed permeated through the whole place. We stayed here overnight whilst at Byron Bay. It is not five star but then you are not paying five star prices. It was perfectly good for what we needed. A good location for down town. We did not use any of the facilities so I cannot comment on them. We were pleasantly surprised with this booking. We normally stay in a hotel or air bnb when visiting byron, however, as we were making a last minute trip there was nothing available in the school holidays. My mum and I booked a 2 bedroom deluxe villa and could not have been happier. These are brand new (or at least look it), are fully equipped with a kitchen, balcony, bathroom, living room and can sleep up to 6 people. We will definitely stay again. One good points was a 20 min walk into town and a 10 min walk to The brewery. The cabin was aircon and heated and had a large fridge, sink and stove. Shared shower block wasn’t the best, leaking showers and toilets didn’t flush. Get your own bathroom and it’s all good! A nice Glamping experience with BBQ options. We love it! Discovery Parks was very good budget accommodation. We paid extra to be in the new cabins and it was well worth it. 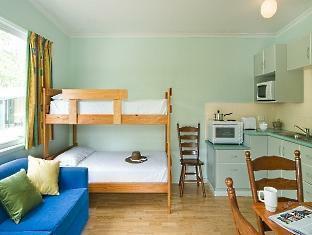 We didn’t have much contact with the staff so we can’t conment on the staff but the room was brand new and perfect. Balcony on the water was worth and extra cash and had great views. Lots od reptiles and wildlife if you’re into that sort of thing! Cute, quirky little tents for the perfect glamping trip!! Perfect for winter as there is an amazing air conditioner, BBQ outside and plenty of bedding. Definitely recommend to anyone - couples, groups, families etc. 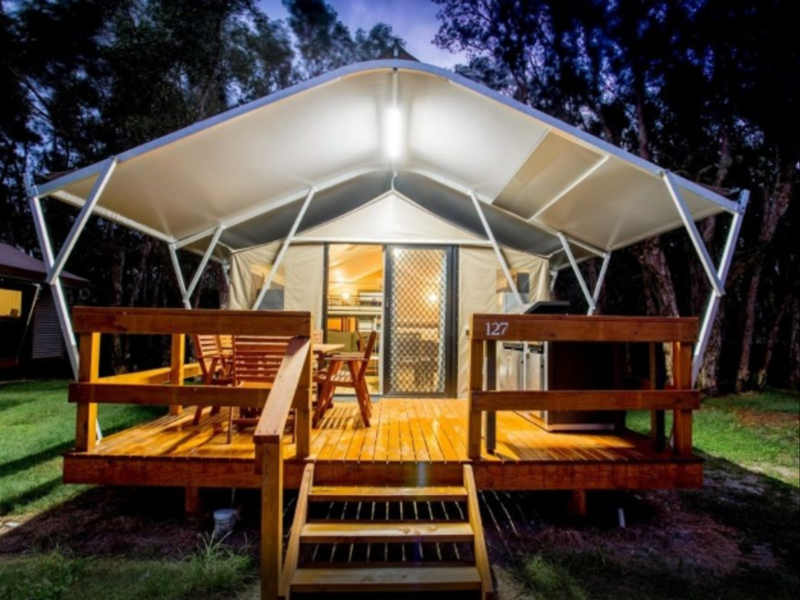 We booked a Deluxe Cabin for $103AUD per night and we're highly impressed! Great studio type accomodation, with balcony out to Lake, kitchenette, full fridge/freezer, TV, heatpump and very new facilities. Camp ground had great facilities available if you had kids, including Waterpark, 2 pools, tennis court and no doubt more. Older cabins looked a little shabby. Located 5 min drive to Byron Township (or maybe 20 min walk), also only 5 min drive to the Stone & Wood Brewery (highly recommend doing the tour, but make sure you pre book!) We will be back. Friendly and helpful staff. Great amenities. Well maintained. We originally wanted accommodation that was within the central area of Byron Bay, but this accommodation was only a very short drive from the town centre. It was nice to return to this peaceful location every day and enjoy the natural setting including the beautiful wildlife. It is a well maintained tourist village with very friendly and helpful staff. We stayed here to attend the Byron Bay Writers Festival and it is in a good location for this. It is about 5 minutes drive into Byron Bay and the sea beach. We originally stayed in an older cabin which was OK but a little aged. My friend had to get the mattress changed because it the springs were uncomfortable. Later we shifted to a newer cabin that was built to accomodate 6. This cabin was better with better amenities but wooul be very squishy for 6. Linen was supplied and was very clean and both the vans were very clean. The staff were great - very helpful. no pavement leading to the cabin. you basically walk across the mud and grass and when it's raining it's gross. bed was miserably small. Great place to stay, clean, well managed and good facilities. It’s slightly out of the town, about a 2-3 minute drive, about 30 minute walk. Highly recommend! Stayed in a cabin. Clean and comfortable for one night. Check in was lengthy as the computers were down. The park felt secure and had good facilities.